Watermelon Size (cm) : 15-20 Diameter Weight (kg) : 2- 5 kg Style : Skin : green brow- Flesh: red Packing: inner: 4kg/6kg/PE/PA bag. Outter: 10kg/15kg styrofoam box Origin : Vietnam , Ho Chi Minh Cultivation Type : Common Certification : C/O, Phytosanitary Port of loading: Hai Phong Port, Viet Nam. Watermelon : Watermelon juice contains citric acid, alanine, glutamic acid, arginine, malic acid, phosphoric acid and other skin physiological activity of a variety of amino acids, still contains adenine and other important metabolic components, sugars, vitamins, minerals Nutrient, the most easily absorbed by the skin, moisturizing the facial skin, sunscreen, whitening. Watermelon ready to export. Good quality and competitive prices. Short on time? Let watermelon sellers contact you. We export Namdhari and Sugar Queen Watermelons which are superior in quality. Watermelon supplied by us is sweeter and easier to eat. These watermelons are originated in South India and exported to all over India. 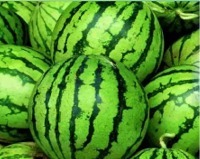 Moreover, Watermelons are enriched with vitamin C and their seeds are enriched with fats and proteins. Appreciated For Longer shelf life No messy seeds to clean up Juicy interior flesh Product Details Product Type : Namdhari and Sugar Queen Water Melons Cultivation Type : Common Maturity : 70-80% Grade : A Brand Name : BSR FRUITS Carton Box Dimension : 445mm x 257mm x 258mm Shipping Method : SEA MOQ (20FT/SEA) : 900 Cartons (9 MT) MOQ (40FT/SEA) : 1800 Cartons ( 18 MT) Storage Temperature : +17’C @ 70CPM/HR Availability : All Year Round Nutrient : Vitamin C Note: Loadability: 1×20 Feet Container 770 Carton Box approximate. (10MT) Delivery: Within 10 days from the receipt of confirmed payment instruments. Supply Ability : 20 Containers per month Packaging: Standard Carton Box(10kg-20 kg/Box) (As per Client requirement) Mode of Payment : 30% advance through T/T & Balance 70% Irrevocable confirmed L/C at sight from prime bank. 50% Advance through T/T and balance 50% at the time of fax copy of B/L. Port of Loading: Krishnapatnam & Chennai. 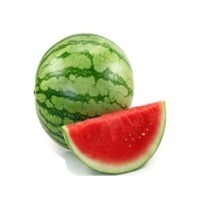 We are the leading suppliers of Watermelon in Tamilnadu. A watermelon is a type of edible fruit, they are 92% water. About six percent of a watermelon is sugar, which makes them very sweet. There are many different types of watermelon. 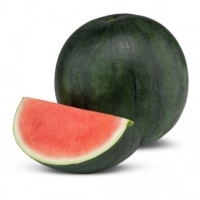 Some have a green rind on the outside and a red-pink flesh on the inside, with black seeds. Some can have yellow flesh, and some can be seedless. The green rind on the outside is not usually eaten, though it can be used as a vegetable. It can also be stewed or pickled. 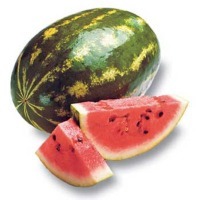 Most watermelons are oblong or spherical. In Japan, watermelons are grown in different shapes. 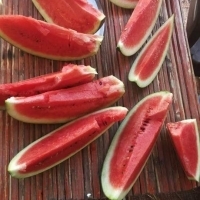 Many people like to eat watermelon in the summer because the fruit is cool and refreshing. 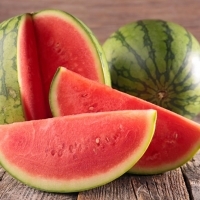 Watermelons are a great source of vitamin A, vitamin C, vitamin B6 and vitamin B1. They also contain potassium, magnesium, carotenoid antioxidant, and lycopene. Watermelons are fruits that come from a vine-like plant. Wikispecies has information on: Citrullus lanatus. We supply good quality and fresh watermelon at very good rate.Interested clients should contact us for supply details. Melon : Melon- reptilian type of melon, large fruit. Smell and taste of melon are also a good addition to the many benefits that contribute to a healthy diet. Rich in vitamins and nutrients. There are 3 varieties: Altynbash, Galia, Golden. Melon helps relieve stress, relieve insomnia and helps with frequent bronchial diseases such as cough, asthma and colds. It is rich in potassium, with the role of sodium from the body due to excessive sodium and is conducive to high blood pressure. 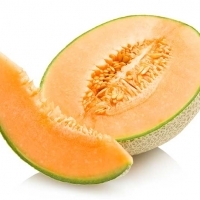 When melon is rich in beta-carotene, it is converted to vitamin A to protect the mucosa. Prevent and improve various eye diseases. Melon is an alcohol-decomposing agent that helps to relieve hangovers. The melon's beta-carotene component is a classic antioxidant that helps prevent skin aging and anti-cancer effect.